Brick Pastry  If you build it, I will eat it! 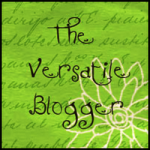 Home » Blog » Brick Pastry  If you build it, I will eat it! my new favourite ingredient! Brick originates from Tunisia but the French have adopted it and now also produce it. It is sold more abundantly than Filo in the supermarkets here and I must say that the French, being no fools, have been quick to embrace it. In Tunisia it is usually deep fried wrapped around a filling of meat, tuna or egg. But I am not a fan of deep frying, I hate overly greasy food and I never know what to do with the left over oil. So I prefer to bake it which is much easier and healthier and makes a fantastic crunchy jacket to all sorts of fillings. The pastry is thicker and more robust than Filo and does not require endless washings of butter to make it malleable. I have found you can be fairly rough with it and it stands up to the job. It is extremely versatile and I think it is inspirational stuff! My Mum introduced to me to Brick only last year when she had a go at making her own spring rolls with it. My Mum is the undisputed queen of the nibble and her delicate little rolls stuffed with noodles; vegetables and prawns were delicious, especially when dunked into some sweet chilli sauce. I immediately stole the recipe (as she always does to me!) and I proceeded to make a platter for a canapé party for one of my clients. 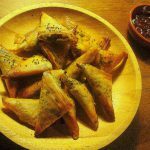 They were a huge success and I was completely sold on Brick as I had found it to be so simple to use, making the perfect finger food. But I got to thinking that the prawns were a little lost in the filling and the sweet chilli sauce was a little over powering even if it was yummy. So I decided to make them using shredded Confit of duck, more fitting living in Franceand more likely to give the stuffing a stronger flavour. 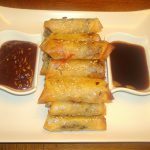 Voilà, my Baked Duck Spring Rolls served with Hoisin and Yakitori dipping sauces were born. The rich duck flavour is there along with the more traditional vegetables and noodles, all encased in the wonderful crunchy Brick pastry. 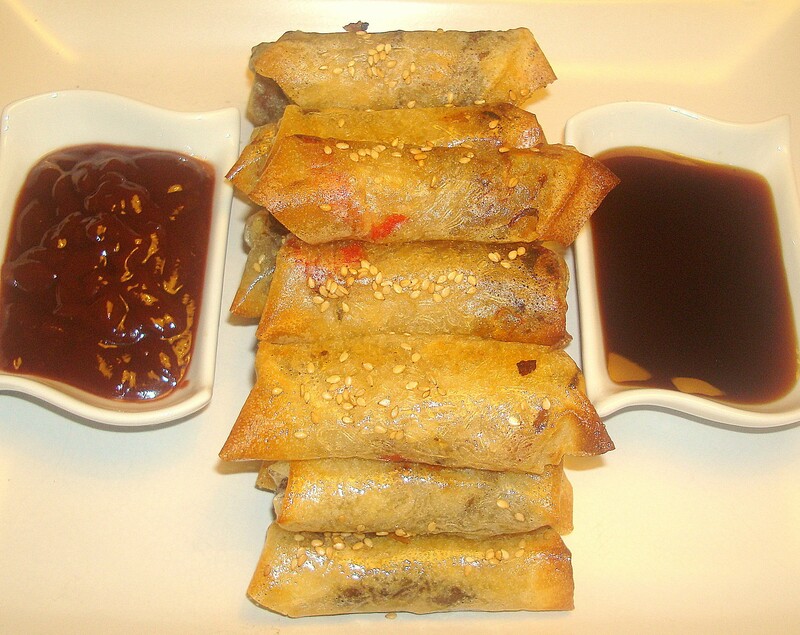 Baked in the oven, brushed with Sesame oil, you would be hard pressed to know that they were not deep fried as they achieve the same level of crispness as a conventional spring roll. These little nibbles are great value for money as a little goes a long way and you can feed a crowd happily with one duck leg. You cant argue with that! 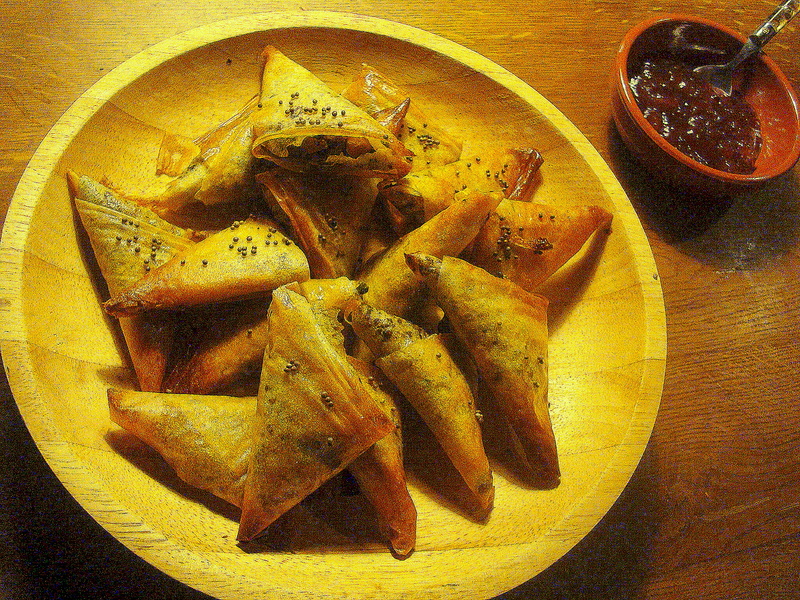 Next up in my experiments in Brick, I decided to try to make Baked Meat Samosas. Again, traditionally deep fried, I was able to bake mine and achieve very good results. The robust pastry was easy to fill and fold without needing you to be super sensitive or particularly nimble fingered. When I lay them on my baking tray, they looked a little hap hazard and I was concerned that they would not hold their shape. But a little brush of oil and 20 minutes later, they were golden and crispy and made a delicious starter served with some mango chutney. I used a filling of minced beef with chickpeas and peas, lightly spiced with cumin and chilli powder. You could fill them with whatever you like but I would suggest that you keep the filling quite dry so that you do not soak the pastry and risk tearing. 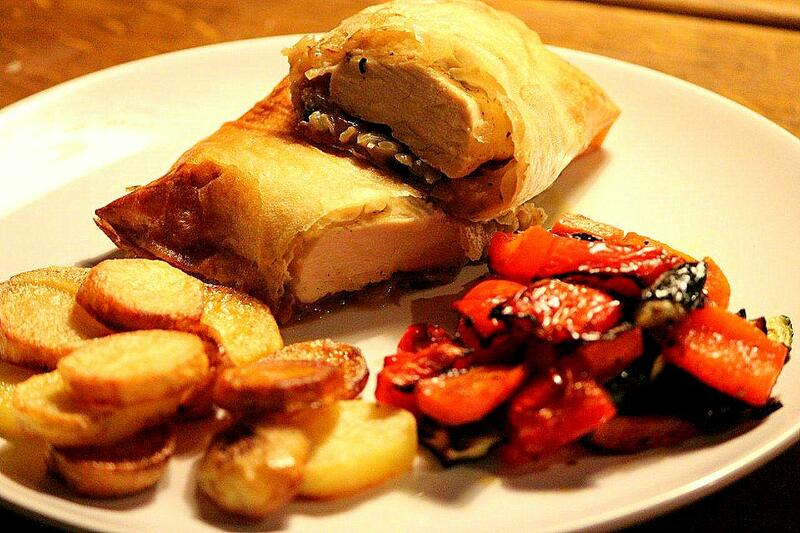 So, after re-creating some classics with the Brick pastry, I decided to try and use it in a main course dish. I am not a big fan of things that are en croute as I dont like eating lots of pastry. I thought that by using Brick instead, it would make a lovely shell for a filling and the whole thing would then be lighter and marvellously crunchy. 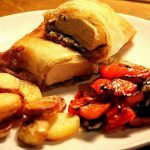 So I made Chicken with Creamy Onions, Mushrooms & Goats Cheese wrapped in Brick Pastry. The results were really good, moist chicken, oozy goats cheese and soft onions contrasting perfectly with the crispy Brick jacket. I quite clumsily wrapped up the parcels and placed them on my baking tray and once again thought they may not hold together and could end in disaster. But left to bake for 20 minutes, the Brick pastry worked its magic and out came lovely looking envelopes of scrummy stuff! Oh wondrous Brick, I do love you! 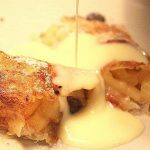 Finally, I used my last two sheets of Brick to make the quickest, easiest Apple & Date Strudel ever! I mixed up some finely chopped apple with dates, sugar and cinnamon and wrapped it in the pastry, brushed with butter and baked for 20 minutes. Out came delicious little crunchy strudels which were divine with some Crème Anglais. They took me just 5 minutes to put together and were warm and comforting and smelled like childhood. Total winners! Is Brick available in your supermarkets? If not, I urge you to seek it out and give it a go. I am sure you wont be disappointed. Happy cooking! 9 Comments on "Brick Pastry  If you build it, I will eat it!" The easiest is Brik a l’oeuf, simply an egg cracked onto a brik sheet, folded and deep fried. Serve with coriander, wedge of lemon and a spoon of harissa. Hooray! I’ve had a packet of brik in the fridge for several weeks but didn’t know what to do with it. I’m going to dive straight into the baked duck spring rolls. I know for a fact they’re delicious because you’ve made them for me : ) Thanks for the inspiration Anneli! I love that pastry and the specialities that are made with it! Thanks Rosa. I am a total Brick convert now and never use Filo anymore! Thanks so much for stopping by. Thanks for the recipes Anneli. I was in Paris recently visiting my daughter who had just had a delightful daughter Elodie, and went to a cafe in a mosque near le Jardin des Plantes. Had and excellent meal starting with a tuna and egg brick and then couscous with meat and vegetables. On returning to Adelaide searched for brick pastry on the web and bingo. Looking forward to cooking it up. I am glad I could help! 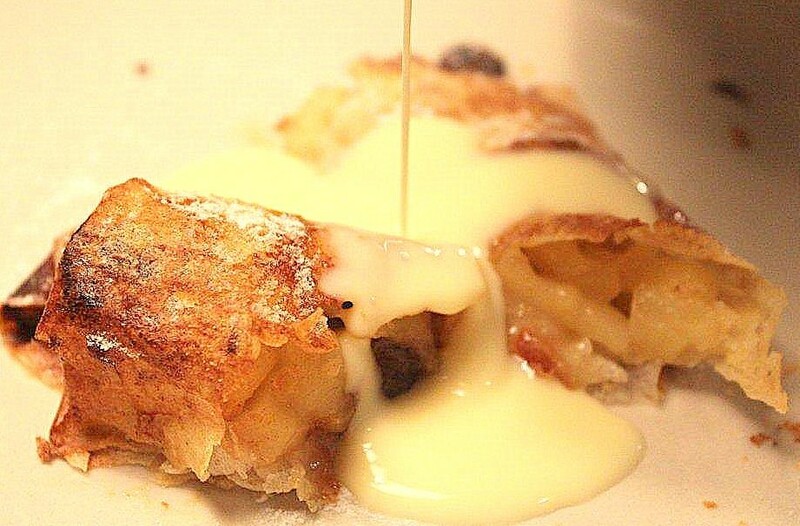 Such a great pastry….so versatile. The tuna and egg brick is a famous combo I have yet to try but I would love to. Thanks for stopping by. Hi – I have just made a version of the Greek feta and spinach pie called Spanakopita using Brick – still in the oven but looks as if it’s going to be a winner.